The Association for the Study of Nationalities (ASN) World Convention is the largest international and interdisciplinary scholarly gathering of its kind, welcoming proposals on a wide range of topics related to nationalism, ethnicity, ethnic conflict, and national identity. Annually held in the spring in New York City at the premises of Columbia University, the ASN World Convention brings together over 800 scholars from around the world to examine and push forward research on issues of nationalism, ethnicity, violence, conflict, economic development, and many other topics. 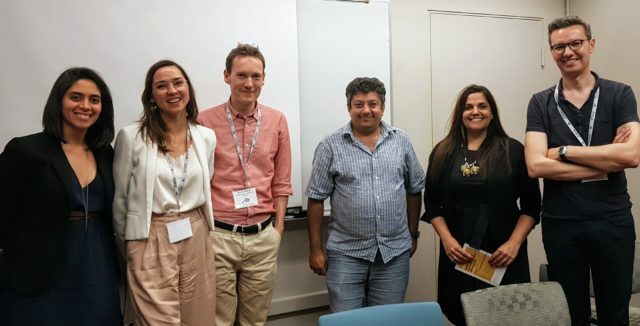 The 2018 ASN Convention included a panel on Critical Romani Studies for the first time, which included Romani and non-Romani scholars. Representatives of ERIAC were among the panelists of the “Critical Approaches to Romani Studies” panel. The panel was chaired by Professor Peter Vermeersch from KU Leuven in Belgium, and the discussant was Ioanida Costache, a PhD candidate in ethnomusicology at Stanford University in the USA. Dr. Anna Mirga-Kruszelnicka, the Deputy Director of ERIAC, presented the paper, “Speaking Back: The Emergence of Romani Scholarship and its Implications for Romani Studies”. Dr. Iulius Rostas, the Assistant Professor and Chair of Romani Studies at the Central European University, presented the paper “The Challenge of Developing Romani Studies: The Importance of Critical and Inclusive Approaches”. The Executive Director of ERIAC, Tímea Junghaus, then spoke about “The Epistemic, Political, and Institutional Development of Roma Art”. The final paper, “From Addressing Anti-Gypsyism to Remedying Racial Injustice,” was presented by Dr. Marton Rövid, a post-doctoral research fellow at the Central European University. During the event, the Critical Romani Studies Journal was presented. Critical Romani Studies is an international and interdisciplinary peer-reviewed journal, providing a forum for activist-scholars to critically examine racial oppression, different forms of exclusion, inequalities, and human rights abuses of Roma. Without compromising academic standards of evidence collection and analysis, the journal seeks to create a platform to critically engage with academic knowledge production and generate critical academic and policy knowledge targeting—among others—scholars, activists, and policy-makers. The journal is edited by a team of Roma and non-Roma scholars who collaborated in the past in organizing conferences and events, including the CEU Summer School on Romani Studies. CRS is published by CEU RSP in cooperation with the European Roma Institute for Arts and Culture and is part of the Roma in European Societies initiative.